There are more than four pools to choose from, with one overlooking the ocean. Walk across the street to the mellow Keawakapu Beach. As you stroll throughout the resort, you'll be treated to an amazing backdrop. Rentals here have a personal touch that can feel "just like home." Look out your balcony onto gardens of flowers, palms, and pines. Head to one of three courses at Wailea Golf Club next door. Stroll to a peaceful beach or spend the day by the pool overlooking the ocean. 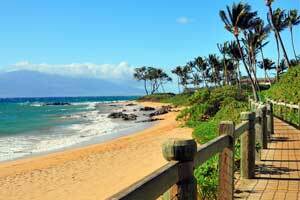 You're free from the crowds of Ka'anapali and Wailea with access to a quiet beach. This sprawling resort community is interspersed with beautiful grounds that have palm and fruit trees. The resort offers direct access to the intimate Keawakapu Beach. Wailea Ekahi Village, A Destination Residence features four outdoor swimming pools throughout the property along with hot tubs. Work on your backstroke or set up camp poolside with the latest issue of People Magazine and catch up on your celebrity gossip. Play a family game of shuffleboard, or get in touch with your inner Serena Williams on the tennis court. Located in luxurious Wailea, you’re close to great nearby dining, championship golf, and designer shopping. Guests receive discounts on golf and tennis at the Makena Resort and Wailea Resort. Air-conditioned studio, one- and two-bedroom condos sleep two to six guests. Full kitchens are equipped with everything you need to make and serve meals. Head to nearby Foodland for groceries. Be sure to get hamburgers, hot dogs, sides, buns, and condiments so that you can take full advantage of the in-suite bbq grill; it’s on your private lanai! Have a family cookout and enjoy the ocean or garden views while you eat. All condos are individually furnished and decorated and have in-suite washer/dryers, allowing you to pack light. Throw in a load of laundry and show off your multitasking skills by watching the big game or a movie on the cable TV with DVD player. Bring favorite movies from home, pop some popcorn and gather everyone on the couch. Spend a day at Keawakapu Beach. Have the kids grab their shovels and buckets while you handle the snacks. Look for seashells, or relax while the kids build a sandcastle - don’t forget the camera for posterity! Up for some retail therapy? Good news! The Shops at Wailea is just a short drive from the resort and offers everything from affordable to luxury brands and dining. First stop: The Coffee Bean & Tea Leaf to get your caffeine fix. They also offer coffee-free options for the kids, like a “Pure” Iced Blended. Pick up a new pair of sunglasses at Sunglass Hut. For apparel, there’s Quicksilver, the T-Shirt Factory, and The Gap. Treat yourself to a new handbag from Louis Vuitton or Prada, or check out the selection of jewelry at Tiffany & Co, Swarovski Crystal, or Greenleaf Diamonds. The ABC Store is perfect for picking up any last minute essentials. Hungry? There’s Tommy Bahama Restaurant & Bar, The Pink & Cork, and Longhi’s. The Wailea Blue Golf Course was designed by Arthur Jack Snyder and offers eighteen-holes of excellent golf. No wonder it was rated among the country’s best golf courses by Golf Magazine and Golf Digest! - The front desk is open daily from 8:00 AM - 9:00 PM. The check-in location differs from the property location. To check in, go to 34 Wailea Gateway Place. A102, Wailea, HI. If you arrive at the property after hours, you'll need to check in at an alternate location: 3800 Wailea Alanui Drive. From the Wailea Gateway Center, take Wailea Ike Drive to the stop light at the Shops at Wailea. Turn left and take the second right to the security gate at Wailea Beach Villas. Here, you will receive room keys and directions to your resort. Please contact the office using the information on the reservation confirmation received after booking. Cribs (infant beds) are available for $20.00 per night. Extra Person Fee: additional $35 per person per night if over standard occupancy and over 12 years old.